"A few weeks ago Obama took Hamas and Iran OFF the terror list." 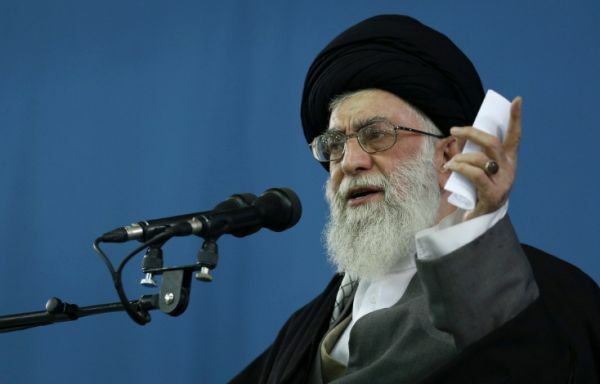 By Louis Jacobson on Friday, March 20th, 2015 at 9:39 a.m.
Iran's supreme leader, Ayatollah Ali Khamenei, speaks to a crowd in Tehran on Feb. 16, 2013. This is an excerpt from Glenn Beck's Facebook page. The confluence of elections in Israel and the possible culmination of international talks on Iran’s nuclear capabilities has vaulted United States policy on Iran to the top of the national agenda. "This is just Evil," Beck wrote, "A few weeks ago Obama took Hamas and Iran OFF the terror list. He is negotiating with Iran WHILE their supreme leader said that they ‘will fly the Islamic flag of jihad over the White House.’ … Christians are being liquidated, beheaded and crucified, their children being sold into slavery, his big bombing plan to stop Isis is SEVEN bombing runs a day. 7!!! How many did we run in Bosnia: 165?!!!" 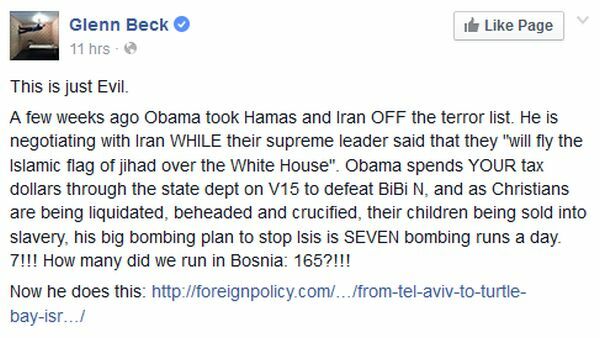 Beck makes a number of claims in this short snippet, but the one that jumped out at us was that "a few weeks ago Obama took Hamas and Iran OFF the terror list." By diplomatic standards, that would be a pretty big deal, especially if it was a unilateral move before a major nuclear deal was even completed. And we certainly hadn’t seen any media coverage about this happening. Did Obama really take Hamas and Iran off the terror list? The short answer is no. Here’s the long answer. The most signifcant "terror lists" are the ones maintained by the State Department. One is for "state sponsors of terrorism." This includes countries "determined by the secretary of state to have repeatedly provided support for acts of international terrorism," and inclusion on the list establishes restrictions on foreign assistance, a ban on defense exports and sales, and a variety of financial and other restrictions. Currently, four nations are on the list: Cuba, Sudan, Syria … and Iran, which has been on the list since Jan. 19, 1984, when Ronald Reagan was president. Nothing with this status has changed in the last few weeks. The second State Department list includes "foreign terrorist organizations." Under United States law, it is unlawful to knowingly provide "material support or resources" to a group on the list. Other restrictions on financing and immigration come into play as well. Hamas -- a militant Islamic movement based in the Palestinian territories -- is on this list, and has been since Oct. 8, 1997, when Bill Clinton was president. Like Iran, it has not been taken off the relevant terror list. So what is Beck talking about? We failed to reach Beck through a representative of his radio network, but judging by previous posts in the conservative blogosphere, we believe he was referring to the 2015 report by the director of national intelligence, James Clapper. Clapper presented the annual report -- "Worldwide Threat Assessment of the U.S. Intelligence Community" -- to the Senate Armed Services Committee on Feb. 26. The report is divided into two parts "global threats" and "regional threats." The global section include such topics as cyber threats, counterintelligence, terrorism, weapons of mass destruction, space, organized crime, global economics and natural resources. The regional section covers most parts of the world, including the Middle East and north Africa. Most of the recent discussion of the Clapper report on the Internet stemmed from a Hebrew-language analysis by the Meir Amit Intelligence and Terrorism Information Center, an Israeli think tank considered close to the country’s military and intelligence sectors. The center’s analysis received coverage in the Israeli media and then quickly spread to the United States. The center’s analysis noted that the "terrorism" section in the 2014 report mentioned both Iran and Hezbollah, but the 2015 section did not. Before we go any further, we’ll note that Beck wrote "Hamas" in his Facebook post when he presumably meant "Hezbollah," a predominantly Lebanese Shiite Muslim party and militant group that is backed by Iran and that has been on the State Department terrorism list since 1997. While Hamas was not mentioned in either of the past two Clapper reports, Hezbollah was mentioned in the terrorism section of the 2014 report but not in the terrorism section in the 2015 report. The conservative blog posts that preceded Beck's post correctly cited "Hezbollah," so we’ll chalk this up to carelessness. Now let’s take a closer look at what changed between the two reports. "Iran and Hizbullah are committed to defending the Asad regime and have provided support toward this end, including sending billions of dollars in military and economic aid, training pro-regime and Iraqi Shia militants, and deploying their own personnel into the country. Iran and Hizbullah view the Asad regime as a key partner in the ‘axis of resistance’ against Israel and are prepared to take major risks to preserve the regime as well as their critical trans-shipment routes. Outside the Syrian theater, Iran and Lebanese Hizbullah continue to directly threaten the interests of U.S. allies. Hizbullah has increased its global terrorist activity in recent years to a level that we have not seen since the 1990s." The 2015 report only mentions Hezbollah once, and it’s in passing. • "Preserving (the) nuclear weapons option,"
• Remaining "an ongoing threat to US national interests because of its support to the Asad regime in Syria, promulgation of anti-Israeli policies, development of advanced military capabilities, and pursuit of its nuclear program,"
• "Pursuing policies with negative secondary consequences for regional stability and potentially for Iran,"
• And pursuing actions to protect and empower Shia communities that "are fueling growing fears and sectarian responses." Administration officials cautioned against over-reading the choices made in Clapper’s written report. "There is no change in the U.S. intelligence community’s assessment of the threat posed by Iran or Hezbollah," said Brian P. Hale, the director of public affairs in the office of the director of national intelligence. The report, Hale said, "was written to be an overview of top threats. … There were a lot of topics to consider this year -- ISIL, cyber, Ukraine-Russia, etc. Iran was included, too." Hale added that Clapper fleshed out the national-security concerns about Iran and Hezbollah during testimony at the Senate hearing. Responding to a question from Sen. Kelly Ayotte, R-N.H., Clapper cited several entities linked to Iran, including Hezbollah, as methods for Iran to use as "a physical manifestation of their spreading their influence in the region." And Nick Rasmussen -- director of the National Counterterrorism Center, the principal adviser to Clapper’s office on intelligence operations and counterterrorism analysis -- testified on Feb. 12 that "beyond their role in Syria and Iraq, Iran and Lebanese Hezbollah remain committed to conducting terrorist activities worldwide, and we are concerned their activities could either endanger or target U.S. and other Western interests." We see two questions here. First, is it valid for him to call the Clapper report "the terror list"? And second, are the changes in the 2015 report -- the basis for his otherwise inaccurately worded claim -- noteworthy? On the first question, experts agreed that the phrase "terror list" is typically reserved for the one with the legal bite -- the State Department’s. Beck has "no justification for calling it 'the terror list,' " said Daveed Gartenstein-Ross, a Middle East expert at the Foundation for the Defense of Democracies. On the second question, Beck may have a point, said Rick Brennan, a senior political scientist with RAND Corp.
"The entire tenor of the 2015 report on terrorism focuses on Sunni terrorist organizations, and there is no mention of Shia terrorist organizations," Brennan said. "The reality is that that Islamist terrorism has both a Sunni and Shia variant. Focusing on one part of the problem and excluding the other is not analytically accurate." Brennan added that he doesn’t see any sign that Iran has "changed its behavior in exporting violence throughout the region" between 2014 and 2015, which raises the question of why the report "significantly softened the tone and tenor of the assessment" of Iran and Hezbollah. However, Beck buried this more justifiable point under several errors and hyperbole. Beck said, "A few weeks ago Obama took Hamas and Iran OFF the terror list." Beck made a few clear mistakes here. First, it appears he mistook Hamas for Hezbollah. Second, Iran, Hamas and Hezbollah remain on the official, and legally binding, State Department terror lists, as they have for decades. Obama did nothing to change that "a few weeks ago." Beck's claim is inaccurate, so we rate it False. Published: Friday, March 20th, 2015 at 9:39 a.m.